2013 was the first year in which I made `\pi` day art. It was a year of dots and love. René Hansen has created an interactive version of this year's posters! Why not go to the Feynman point directly! 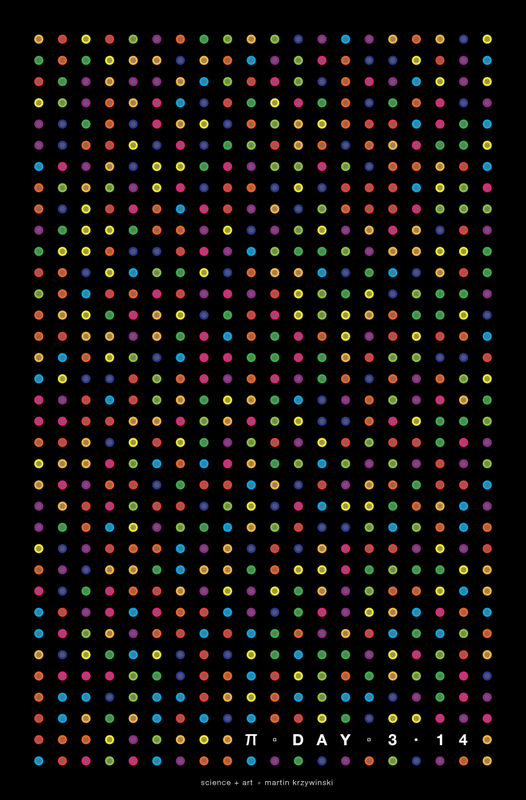 ▲ Each digit is represented by a dot of a different color. The inner grey dots appear to glimmer—this is the luminance effect in action. 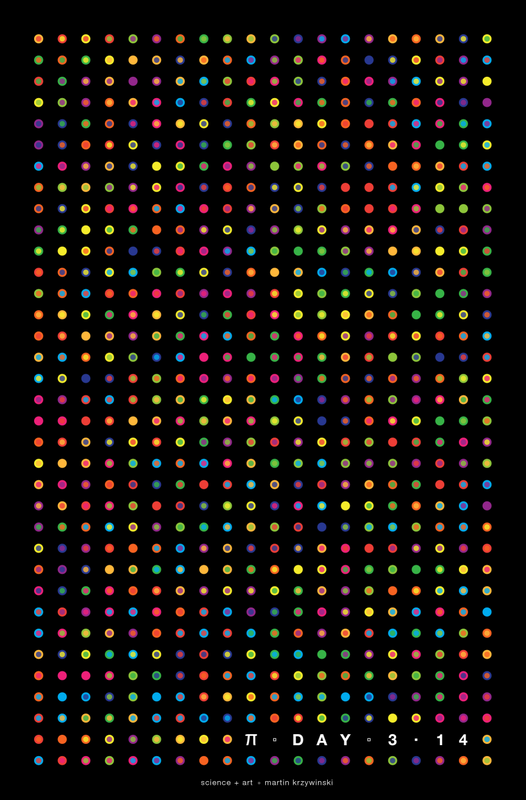 The posters explore the relationship between adjacent digits in `\pi`, which are encoded by color using the scheme shown above. The design appears to shimmer due to the luminance effect. 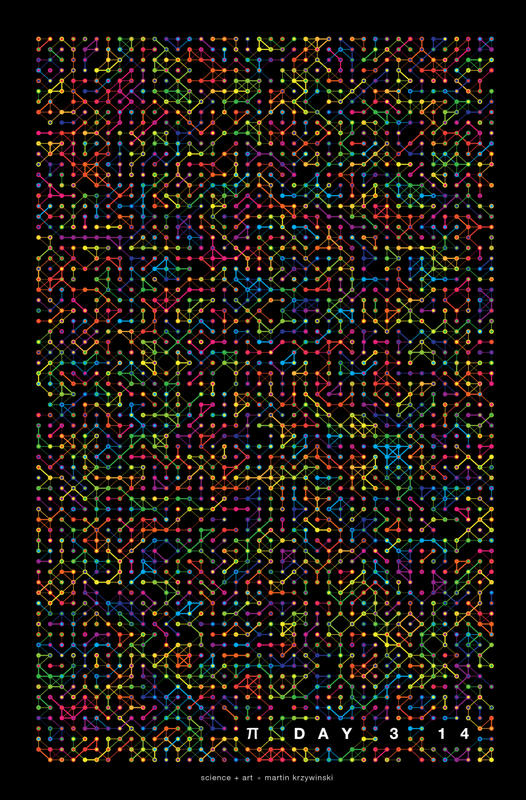 In some versions of the poster, adjacent identical (or similar) digits are connected by lines. corresponds to the case where outer circle color encodes the `i`th digit and the inner circle color encodes the next digit `i+1`th. In this scheme, inner and outer circles of adjacent positions have the same color. The posters were generated automatically with a Perl script that generated SVG files. Post processing and layout was done in Illustrator. If you are interested in depicting your favourite number this way, let me know. The design was inspired by the beautiful AIDS posters by Elena Miska. 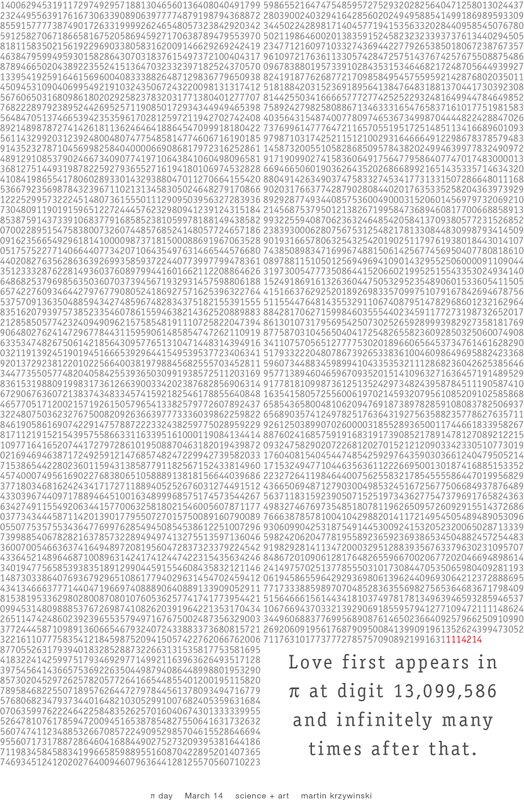 I calculated `pi` to 13,099,586 digits and then I found love. It's fun to look for digits or look for words in `\pi`. Just don't get carried away. Because `\pi` is likely normal in base 10, all words and all patterns appear in it, somewhere. I wanted to know the first time that "love" appears in `\pi`. 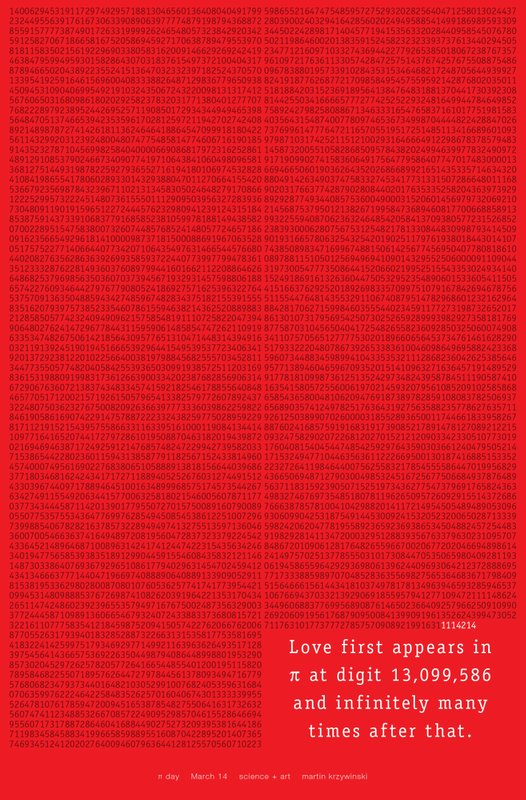 When encoded using the scheme a=0, b=1, ..., z=25, "love" is the digit sequence 1114214. This sequence appears first at position 13,099,586 (...892199163111142148187311392...). And, of course, infinitely many times after that. Curiously, "hate" (0700194) appears well before love, at digit 514,717. In the first 200,000,000 digit "hate" appears 23 times, 6 times more than "love". If you use the scheme a=1, b=2, ..., z=26, then "love" becomes 1215225. This is first seen at 6,317,696 (...610311912912152256606850141...).